Greetings... This is going to be an informal post as this is just a quick impromptu post. As much as I tried to fit EVERYTHING into my daily schedule I found myself doing wayyyy to much and had no other choice but to let some things go!!!! Blogging just happened to be one of them! I'm trying to utilize my time more efficiently and maximize my time management. I also, want to give my readers quality posts so as for now I've decided to take a "BLOG BREAK" ~ I'm not exactly sure when I will be able to come back as I have a FULL plate. I'm NOT complaining because I've been truly blessed and enjoy eating off the plate that I've been given but I also want to make sure that I digest it all in order to be well balanced. I've been blogging for 3 years and Blogging is NOT my BUSINESS; it serves as a HOBBY for me and I thoroughly enjoy blogging and reading other blogs but it has slowly started to become more like an underpaid JOB for me. I know it's all in what we make it but I haven't been making it as of late. As much as I REALLY wish this was all just an April Fools JOKE it's NOT as I'm NOT sure when I will return to the blogosphere and if I will EVER return but what I do know is I'm only a social media network away! NOTE TO YOU: AGAIN, Thank you all for your patience and understanding while I try and get my blogging MOJO BACK! I've been MIA from the blogosphere but this time is for good reason... As stated in my last post on Valentine's Day - I went out of town for a few days and when we returned home we got news that my Father-N-Law passed away. My Husband took it harder than expected and everyday we had a host of family and friends that came over to visit. We are still receiving cards, calls, and texts and I'm so very thankful for everyone who reached out to us during this difficult time. So, with that being said I did my nails last week in honor of my Father-N-Law... Death is NEVER easy but God don't make NO mistakes! 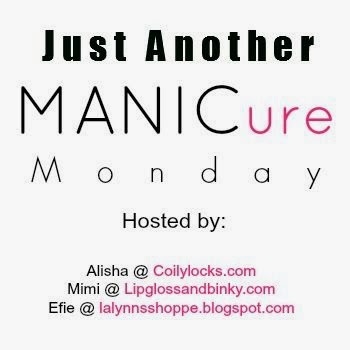 This week I'm hosting so be sure to link up below and show off your Manicure! NOTE TO YOU: Thank you all for your patience and understanding while I try and get my blogging MOJO BACK! I'm on my way to a weekend getaway with hubby and and a few friends but I wanted to stop by and wish you all a Happy Valentine's Day!!!!! I know a lot of folks don't like to admit that they look forward to this day or that they don't celebrate but I LOVE LOVE and anything that has to do with LOVE. So, I'm just as excited about today as I would be any holiday spending it with Family and Friends. I'm sharing a OOTD that I wore this past Sunday to Church and to a Birthday Brunch. NOTE TO YOU: I'm STILL undecided about my Valentine's Day outfit but I'm linking up for Mamanista Friday & Wishing everyone a sweet weekend filled with LOVE! Wordless Wednesday... Super Bowl Party Photo Recap! This ice storm has me on edge... YES! I know, I know... to make the best of it and I was doing just that as my girls made me breakfast in bed. Breakfast in bed... Thanks to my babies! But once trees started falling and my lights went out I was DONE! My lights just recently came back on and 1st thing I did was ran downstairs and cooked! I've been snacking all day but I wanted us to have a decent home cook meal. Since the lights are still shining and while I STILL have time I'm going to share a REALLY quick post for “Wordless Wednesday” as the "procrastinator" in me never shared our Super Bowl Party that my Hubs & I hosted at our home on Super Bowl Sunday. Yours Truly cheesed up for the game and those Super Bowl Nails! My Friend Tess was the winner of the Movie Gift Basket as she guessed the closest score! Although, I'm NOT a Football Fan and just a FAN of Super Bowl... I MUST say: WOMEN who watch FOOTBALL & Understands it TOTALLY ROCKS! As you already know we were cheering for the Broncos but that WIN didn’t happen. NOTE TO YOU: I hope you all enjoyed the photos and if you are experiencing any of this COLD weather, snow, and/or ice storm please be safe and try and stay warm. Disclaimer: All projects were DIY by yours truly. Images were printed via google images and applied w/ glue. The Cupcakes sticks were done using images & toothpicks, you can purchase bottles at the $1 store and use any image and glue on the bottles. Hershey Kisses - use stickers or print your own images in the theme of your party. Lastly, the movie gift basket is filled with $1 candy, shredded paper and a movie gift card. If you have any questions and or concerns you can simply ask in the comment section and I will gladly respond. Thanks! I was going to go with the typical "Valentine" Mani but figured everyone would be sharing those this week so I decided to do the opposite. This week as the host of "Manicure Monday my nails were inspired by the colors of the soriity AKA. Mimi of (Lipgloss and Binky) should be very PROUD of me. *Claps hands* I must say that that the ladies of this sorority has been nothing short of amazing. They have REALLY supported me when it comes to my business. When $ALES are low there is ALWAYS an AKA sitting back ready to place an order. So, I salute and honor them this week w/ my Mani for showing my business so much LOVE! These colors screams: SPRING TIME!!!!! - Which I'm sooo READY for! NOTE TO YOU: The dots were done using a dotter... I use to use Q-tips or a toothpick but I finally upgraded and purchased a dotter from Amazon for as low as $2 for a pack of 5. Just Another MANICure Monday... w/ Linky! Wow... I can't believe that we are in the 3rd week of the "New Year" and the days are rolling by SUPA FAST! I haven't blog in what seems like 4 EVA!!!! I don't have a legitimate reason for NOT blogging other than being the BIGGEST procrastinator known to man/woman kind! At any rate, I hope everyone year has started off to a GREAT start. 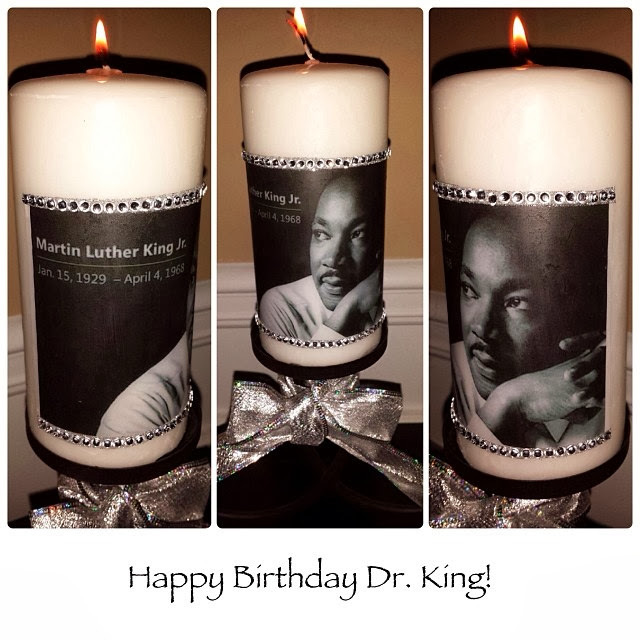 Today, is observed Dr. Martin Luther King Jr. as he recently had what woud have been his 85th Birthday and in his honor I created a candle in his remembrance... May his light forever shine in our lives!!!!! ~"Darkness cannot drive out darkness; only light can do that. Hate cannot drive out hate; only love can do that." -Martin Luther King, Jr. I REALLY wanted to do my nails in something symbolic towards "King Day" - today is a GIFT and everyday should be treated as such! Therefore, my mani was inspired by the word: GIFT! Andddd... what girl doesn't like GIFTS!!!!! Which reminds me of one of my very 1st gifts from my Hubs was a Tiffany Necklace & Bracelet. It was my very 1st time EVER receiving a little blue box so I was STOKED! This week I am your host so be sure to link up and show off your Manicure! NOTE TO YOU: This was my fill-in week so this week Mani was NOT done by me they were done by Kim Nguyen Lee at The Nail Spot! Also, don't forget to link-up and show-off your MANI!